We have mentioned this on more than one occasion before, but the customization of iOS and the way it looks is arguably the biggest reason anyone chooses to jailbreak their device. That is highlighted by the number of jailbreak tweaks that are available with the intention of making an iPhone look just the way its owner wants it to. When it comes to jailbreaking, you can never have enough customization options. 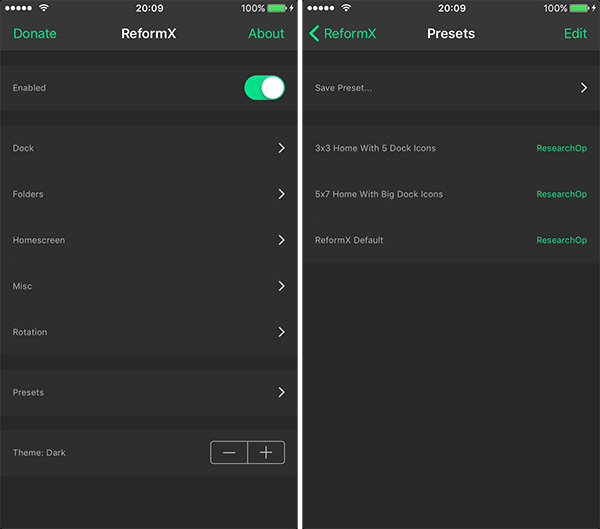 One tweak you may want to check out if you like to fiddle with your Home screen is ReformX. Available to download from the BigBoss repository and costing nothing, ReformX is all about giving iOS users control over how the app icons on their Home screens look. Where things start to get interesting though, is the preset function. While there are countless tweaks available via Cydia that are more than capable of altering how a Home screen appears, including the app icon size, what makes ReformX so useful is its ability to save presets of how a device is configured. 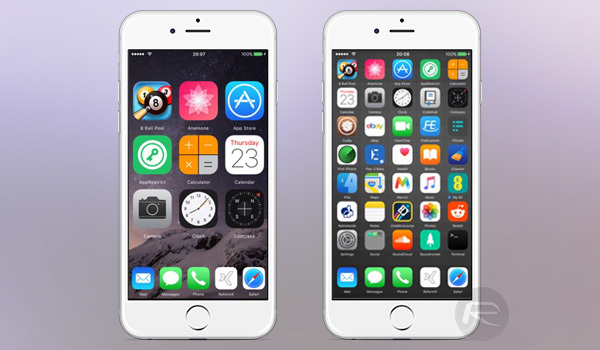 It kind of reminds us of HomescreenDesigner tweak from iOS 8 days. This feature not only acts as a backup of sorts, allowing devices to be instantly configured just so, should the worst ever happen, but it also means that friends can share configurations and settings amongst each other. Want your iPhone to look like your friend’s? No problem. That all sounds good to us. Head on over to Cydia and the BigBoss repository to download ReformX today. Be very careful…. this does not work well with a lot of other tweaks …. completely screwed up my screen layout….. even after I uninstalled it I couldn’t get my layout to return to normal…. couldn’t get stock apps to return to the start screen even after a reboot and re jailbreak…. it had corrupted another tweak which I luckily found the one it was but only after I had resorted to a complete settings reset …… be very careful with this one.!!! doesn’t even work. luckily it didn’t screw up my home screen or i’ll go crazy, lol. UNINSTALLED!! Thanks man, sorry you had to go through that. This worked great. It made all my icons large enough to see without glasses. the bug I found- it does not play nice with Apex 2- that adds others apps behind the front one- grouping in 4s without folders. ReformX prevents the hidden ones from opening when icons are at 130% blown up. Sad, cause this was a good replacement for Springtomize 3. They open at normal size. Lol. Yeah, like the >50 set! !